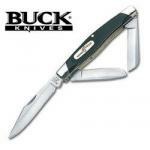 Buck knives are so familiar to Americans that many of us do think it’s a type of knife instead of a company name. 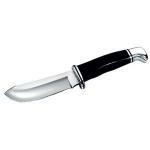 Buck knives aren’t just for deer hunters, although hunting and skinning knives do make up a large part of their business. 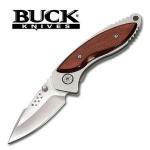 Buck gained an early reputation as a maker of affordable knives of high quality, with blades that you could hone razor sharp with confidence they’d stay that way. If you buy a Buck knife you’ll own it for a long time — the company also sells replacement sheaths, because people carry Bucks long enough to wear the leather out. Hoyt Buck made the first Buck knife while still a blacksmith’s apprentice in 1902 Kansas. Hoyt invented a new tempering method which produced steel blades that held an edge longer than other knives of the day. Hoyt used old files as stock for his knives, grinding and tempering each one personally. After WWII in 1947, Hoyt and his son Al moved to San Diego and went into business together. 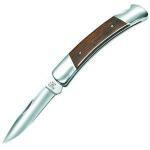 Al Buck’s 1967 invention, the Buck 110 Folding Hunter, became a mainstay of the company’s business. Today the Buck family still owns and operates the company. Josh Buck, a member of the fifth generation of the family to work in the business, recently designed the Gen-5 Skinner, a modern interpretation of his great-grandfather’s good ideas. Buck’s fixed blade hunting knives would probably be the company’s best known products, but from WWII onward the Buck family also produced quality tactical knives, with many offerings in both fixed blade and folding patterns today. 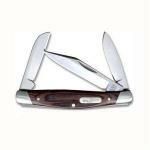 Buck’s focus on outdoor knives led to innovations like lockback and one-handed opening systems. 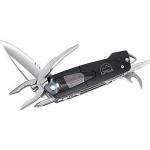 Those conveniences enhance many Buck products designed for professional search and rescue workers as well as outdoorsmen looking for a better blade. 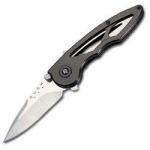 The Buck Rush uses assisted opening for even faster one-handed operation. Buck’s limited edition series has the collector in mind and employs the unique skills of artisans like David Yellowhorse. 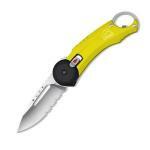 You’ll find a few multi-tools and hatchets in the catalog as well. Some knives look too good to use, and this 8-1/2-inch full-sized skinner (with a 4-1/4-inch hollow ground high carbon stainless steel gut hook blade) almost crosses the line into the collector's zone. 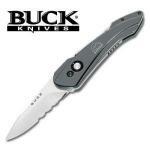 Fortunately, like the other knives Buck makes, it was built for work. The collector's version of the Buck Gen-5 Skinner series designed by Josh Buck, great-grandson of the company founder, the Gen-5 Guitar Skinner with Cocobolo hardwood handle is a limited edition of 1,000 numbered knives. Each purchase includes a Certificate of Authenticity verifying the knife's place in the series. 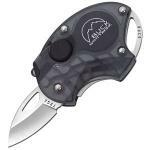 Buck's small pocket clip folder, the Buck Rush in ATS-34 high carbon stainless steel, features the assisted opening system called ASAP. Buck claims the knife will be safer for pocket carry than a fully automatic knife and open with speed that's competitive with a standard switchblade. 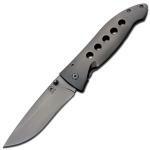 If you're looking for pure function, the Buck Omni Hunter ought to be of interest. 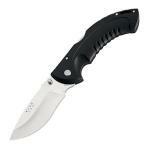 The Omni 397BK gives full size features in a folding lockback with ergonomic grip, and it comes with a belt sheath. For rough country use, a belt sheath beats a clip any day. 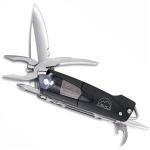 Buck produced this climber's knife in collaboration with mountaineer Peter Whittaker. The 436DPL Short Revolution overcomes some of the weaknesses of the usual lockblade folder and keeps the important perks. Precious stones, custom craftsmanship, and a durable framework make this Trapper by Buck Knives aptly suited for proud display or occasional use, whichever the case may be. 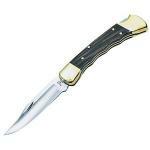 Small enough to carry as a pocket knife, stout enough to be useful as a hunting knife, this update of Buck's 1964 invention, the lockback, is a smaller variation of the knife I've carried on backpacking trips for more than ten years. 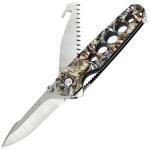 Buck Knives makes this folding knife with a charcoal, camo or rosewood handle. Pictured at right is the rosewood version. 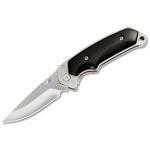 This folding knife has a really sturdy design, and is covered from tip to bolster with all sorts of cutting options. The 119 Special is Buck's best-selling hunting knife, and for good reason. 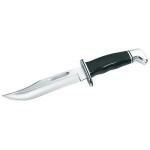 It's a strong, no-frills knife that has everything you need in a hunting knife and nothing else. And it's less than fifty bucks. Talk to people about their Buck 110 knives and they get all misty-eyed. While not quite as much of an icon as the '57 Chevy, it's still got a special place in American history. 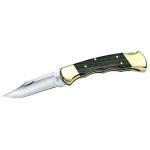 Buck Knives makes high-quality knives. Many pocket knives skimp on the quality of the blade itself, but this one's from Buck so you know it won't fall short on that front. 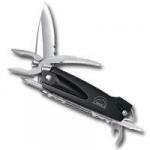 This particular model of multi-tool offers versatility and usability in a compact format. 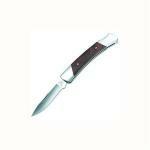 The 325B Colleague knife from Buck Knives combines form and function in an elegant but practical package. 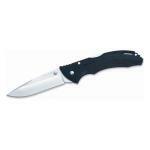 The stainless steel, tapered 1-7/8 inch drop point blade is hardened using the sophisticated Edge 2x blade technology.